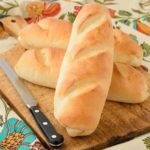 A recipe for Vienna Hoagie Buns that are great for sandwiches. These white buns have a chewy inside and a crisp crust on the outside. In the bowl of a stand mixer, combine 2 1/2 cups flour, yeast, sugar, and salt. Whisk to combine. Add warm liquid to the bowl and stir to combine. Place bowl on stand mixer with the flat beater. Add 1 cup of flour and mix on medium-low speed for 3 minutes. Switch flat beater to dough hook. Turn mixer to speed recommended for using the dough hook. Gradually add enough remaining flour to make a firm dough. Place dough in the greased bowl and turn to coat surface. Loosely cover with plastic wrap or a tea towel. While the dough is rising, grease two baking sheets. Punch down dough. Divide into 8 equal pieces (recommended to use a scale). Roll or pat each piece to an 8- X 4-inch rectangle. Start with the longer side and roll up tightly while pressing dough into roll with each turn. Pinch edge and ends to seal. Place buns on the cookie sheets, 4 per sheet and spaced equally apart. With a serrated or very sharp knife, cut 2 to 3 slashes across the top of each bun. Cover buns with a tea towel and let rise until double, about 20 minutes. Pre-heat oven to 425 degrees F. In a small bowl, whisk together the egg white and 1 tablespoon of water to make an egg wash.
Brush egg wash on tops of buns. Bake buns for 15 to 20 minutes, until golden-brown. Rotate buns half way through baking for even browning. Remove buns from cookie sheets and cool on a wire rack.